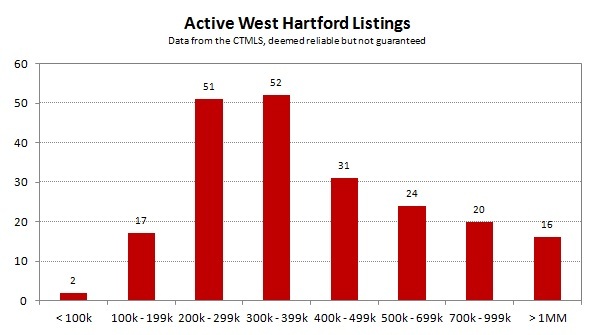 The West Hartford real estate market finished September 2013 with 52 closings, which was nearly 24% more than the total from September of last year. 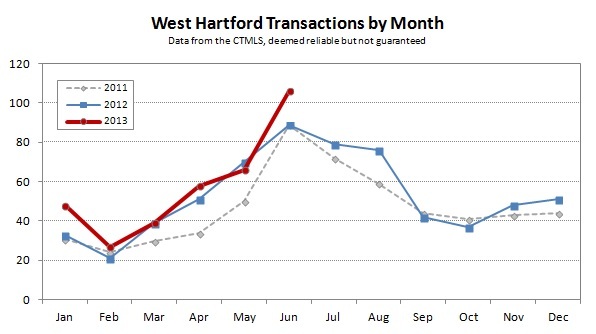 For the whole year, the 2013 transaction total is about 13% ahead of 2012. There have not been any major changes in the stats since August. The distribution of closed deals has been pretty consistent over the different price bands. The number of properties under contract has fallen slightly from 104 to 102. The number of active listings has increased from 220 to 225. Inventory levels are beginning to increase. 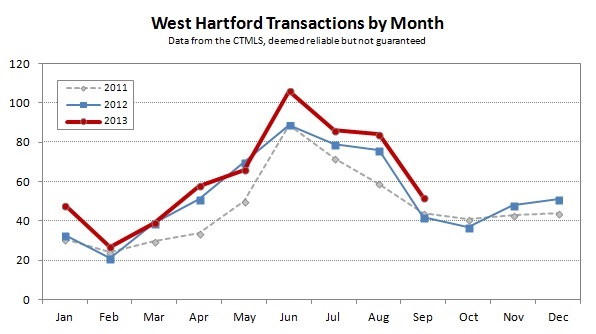 We noted the other day that Hartford County buyer activity was surprisingly weak in September considering how August ended. West Hartford was in line with this trend, with about a 3% decline in the number of contracts written compared to September 2012. That said, there are still a lot of homes under contract, waiting to close, so the final tally of completed transactions will certainly surpass the 636 we had in 2012. So far this year there have been 566 closed deals. 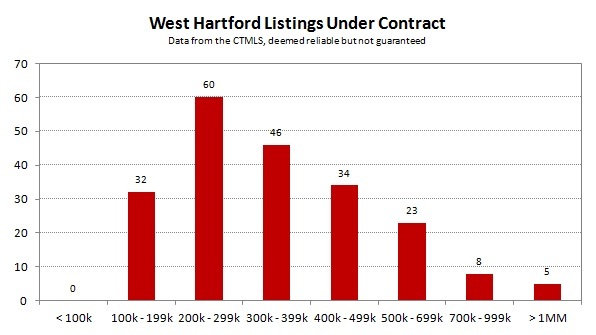 The majority of the 102 homes under contract as of 10/4 (when we collected the data) should close this year, which means that we’re on track to have our best year in West Hartford since 2007. 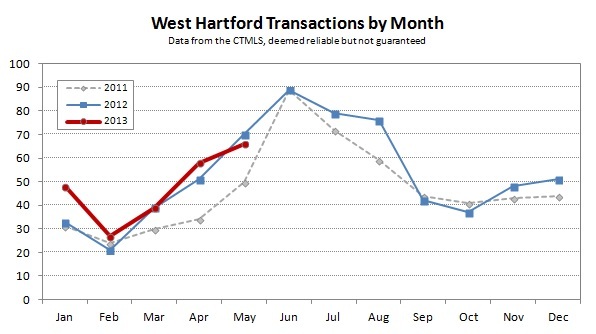 July was an active month in the West Hartford single-family real estate market, but not quite as exciting as June. There were 86 closings in July, which was modestly above the 2012 count, and on a year-to-date basis we are about 12% ahead of 2012 in the total number of closed deals. The statistics can shift a lot over the summer months. Buyers that put properties under contract in the spring close on those deals and move in to their new homes over the summer, so June and July tend to be the peak for closings. At the same time, the number of homes under contract will begin to shrink – there was 158 under contract in June versus 144 right now. The change in the number of active listing is less predictable, and it has remained almost identical to what we reported in June. The charts below show that the inventory of active listings in the $200,000s has increased since the June report. This is the most active price band in town, and is just below the median sale price for West Hartford MLS deals – the median price in town was pretty consistently right at $300,000 for 2010, 2011 and 2012. You can find lots of different types of homes with prices in the $200,000s. There are nicely updated smaller homes in many neighborhoods, medium sized homes in very good condition in a few neighborhoods, homes that are a bit dated, and homes that need a complete overhaul. It’s not yet clear why inventory is increasing in this price band, especially because there is less available in the $100,000s, the $300,000s and the $400,000s than there had been in June. Our guess is that buyers have slowed down on buying homes that need updating. It also looks like there are a few properties in the price band with quirks that will require waiting for the right buyer. At upper West Hartford price points, sales activity continues to be taking a slower pace. There are many fewer listings with asking prices of $700,000 and the market dynamics are distinctly different. Overall, West Hartford has had a strong year in 2013, and it will be interesting to see what kind of fall market develops in the coming months. The West Hartford single-family real estate market continues to outperform 2012 in a year-over-year comparison. Closings in June jumped up to 106, which was the best individual month for the town since June 2006 (with 114 closings). Many buyers like to close on their new homes in the summer months. June is usually the peak for closings, with July and August showing modest declines from a June peak depending on the overall strength of the market. The last few years have followed this basic trend. Closings typically lag behind contracts by about a month and a half, since that’s how long it takes to get through the inspection and mortgage approval process. Some buyers are able to move more quickly, while others choose to take it more slowly. There were 102 single-family homes put under contract in town in May, versus 66 in June, so we do expect the closing count to fall off over the summer months again this year. 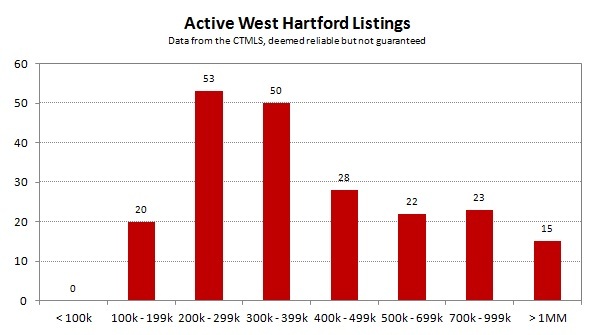 The inventory statistics in West Hartford show that the market is still favoring sellers at price points up to $500,000. That’s not to say a seller is guaranteed to have a bidding war for their home – sellers still need to pay attention to the signals the market provides. However, nicely updated properties are attracting attention when they are listed. Home buyers are also taking note of properties that need some work. The key in both cases is that the homes need to be priced properly for their location and condition. 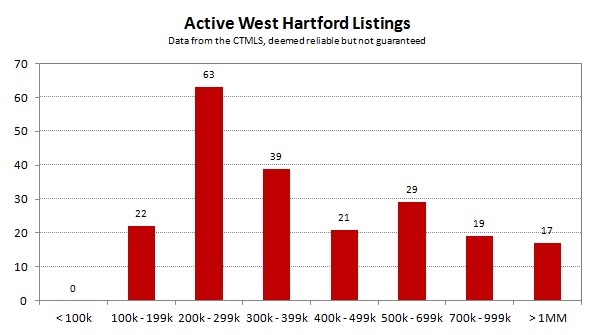 Here are the June stats for the West Hartford single-family housing market. 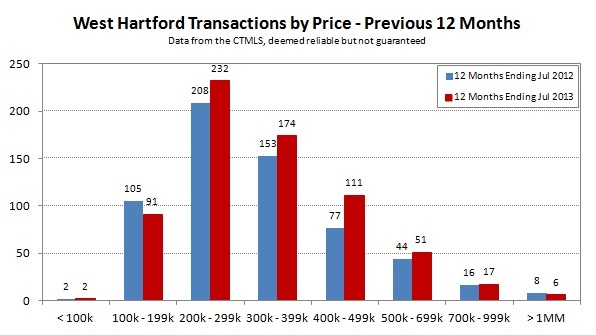 West Hartford continued to see a strong real estate market through the month of May. Below are the four main charts we track to keep in touch with the overall market in town. Closed transactions were down slightly in May compared to May of last year, 66 versus 70. Despite that, 2013 has outperformed 2012 in deal count over the first five months by about 11%, with 238 closings compared to 214 closings. Looking at the closed sales over the previous 12 months by price band, we can see that the largest increase in activity is in the $300k to $499k price banks. These homes are an important part of West Hartford’s core housing stock and show that there is interest and activity in the market. This monthly snapshot, as we approach the end of the spring market, should show a lot of homes under contract, and it does with 209. Many buyers like to close on their new homes over the slower summer months to make moving easier. The top chart also confirms this trend, with the peak of closings in both 2011 and 2012 occurring in June. New listings continue to pop up on the market, and tend to show up all year round. 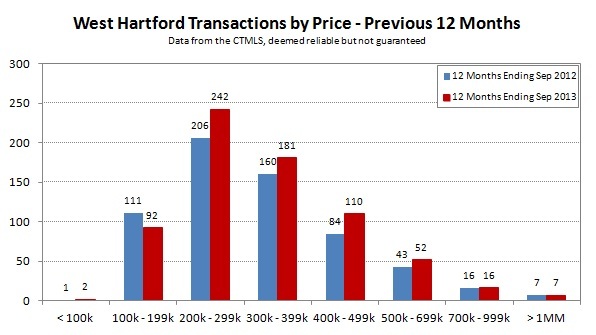 West Hartford is an interesting market because it is the largest in the County (most number of deals), so it always seems like there is something going on. 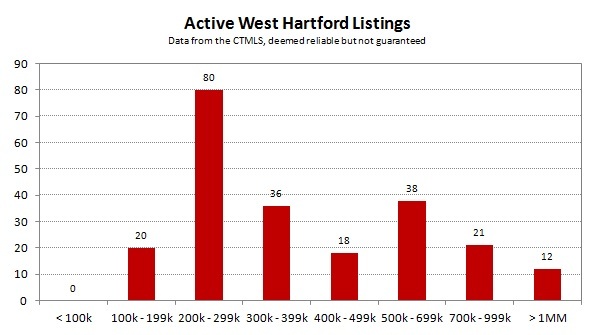 But West Hartford is also one of the most diverse in the County, with homes commonly selling in the $100,000s all the way up to $1,000,000+. There are definitely times when the selection and inventory in particular sub-markets feels very limited to buyers. This is especially true when buyers are focused in on a specific price band and neighborhood within town. Competition can be intense despite there being 214 active listings as of the time we pulled this data.